Forest Park Homes: GREAT PRICE FOR THIS BEAUTIFUL 4 BEDROOM + DEN POOL HOME ** ONE OF THE LARGEST FLOOR PLANS ** RARELY AVAILABLE ON STOW WAY ** NEW TILE ROOF BEING INSTALLED ** Secluded back yard opening onto lake. Tile and wood floors throughout. Great appliances including Samsung washer and dryer. Convenient location in the community near the gated entrance and clubhouse. Forest Park Homes: A beautiful screened-in pool overlooking a lake sets the scene for this 4 bedroom, 3 bath home. Sitting on an oversize lot on a quiet cul-de-sac with lake views from every bedroom, this home is perfect for a large family or someone needing a parent en suite or luxurious guest suite. Entering the living room you look over the pool and lake beyond. The family room with full opening sliders out to the pool creates an entertainment area to host large parties or family dinners at holidays. Forest Park, the best kept secret in Naples, is situated right next to a county park which provides a boat launch, dog parks, tennis courts, walking trails and sports fields. With low HOA fees, Forest Park is close to the beaches and 5th Avenue shopping. Forest Park Homes: Enjoy this well maintained 4 Bedroom plus Den Home, located on a small Cul de Sac with Beautiful Lake Views. Sunsets are Amazing to watch from your Spacious Screened in Lanai, with plenty of room to add your own Private Pool. The Exterior was recently painted and new Landscape Lighting was installed. There was also a new A/C Unit installed in 2017. The Fenced in Side Yard is Great for the Children and Family Pets to Play. Just under 2800 sq. ft., this is a Great Family Home. The Kitchen has Granite Countertops, a Work Island and a Pantry. The Master Bedroom is 22' long with French Doors exiting to the Screened Lanai with Beautiful Lake Views. There are 2 Walk-In Closets for Him & Her and Master En-Suite with separate Bath Tub & Shower. Shutters are on all the windows and doors which were a great plus when Hurricane Irma hit Naples in 2017. This home did not have any damage at all. There is a Community Swimming Pool, Fitness Room and Games Room with a Pool Table at the Clubhouse. This is a Wonderful Quiet Gated Community close to the Beaches and Shopping. THIS IS A MUST TO SEE! Forest Park Homes: IMMACULATE POOL HOME IN A PRIME LOCATION! 8 MIN. AWAY FROM THE BEACH, DOWNTOWN 5TH AVE. , SHOPPING, DINING, AND SCHOOLS! Home is located in the beautiful Forest Park Gated Community! Featuring 3 bedroom + den/ 2 bathrooms, 2 car garage, with 1,896sq.ft living area and boasting a tremendous 2,383sq.ft total! Walk through the double door entrance and be in awe when you witness the large family room with vaulted ceiling and recess lightening to optimize the living area! While the kitchen has been remolded to perfection, with porcelain tile, quartz counter-tops, wood cabinets, and a breakfast bar! The master ensuite takes over one side of the house offering a large master bedroom, walk-in closets, a shower big enough for two and a tub! Walk into the backyard and witness the large screened in pool, and lake view. Forest Park is a friendly gated community with amenities including; community pool, exercise room, tennis court, and play ground! This home will not last on the market!! Forest Park Homes: Family ready lakefront single family home! NEW ROOF! NEW GUTTERS! NEW PAVERS! Situated on an oversized corner lot of a low traffic cul-de-sac road w/ mature landscaping, having a road side privacy hedge & a view of the lake on the other side of the lot. Offering over 1,900sf of living space in a great room & split bedroom floor plan, this meticulously maintained & updated home features new wood plank tile flooring, freshly painted interior, and a stunning master bath remodel featuring custom shiplap walls and a contemporary designed soaking tub. The beautifully remodeled kitchen hosts quartz counters. designer cabinets w/ tall uppers, tile backsplash, and stainless steel appliances. If you love outdoor living while having all the conveniences of deeded neighborhood life then this home is for you w/ a screened front lanai, spacious screened rear lanai, large side yard, and a huge open lanai offering a peaceful view of the lake. Forest Park offers a pet friendly atmosphere and has a community center w/ pool & a fitness room. 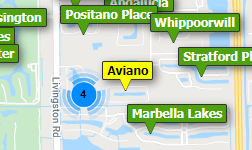 Near the heart of Naples with luxurious shopping, beaches, NCH hospital, and any variety of high quality restaurants! Forest Park Homes: This beautiful expanded Carerra model sits on a premium LAKE FRONT lot and has a rare and sought after SE exposure. With plenty of privacy from the preserve across the water and an extended patio, this warm home offers a lot of room to enjoy our beautiful weather. You will notice a lot of upgrades like tray ceilings, wall wood inserts, french doors, crown molding, plantation shutters and much more...Conveniently located in Central Naples, Forest Park is a unique community with LOW FEES and a beautiful clubhouse that offers, fitness, billiards and a community pool. Forest Park Homes: This property has had one owner who maintained the property in like new condition. Located on a large lot with lake in rear producing beautiful sunsets. HOA maintains landscaping so there is little maintenance. Brand new roof installed. Ask listing agent for more details. Mostly tile throughout, except in Master Bedroom and 2nd Bedroom that are carpeted. Kitchen has hard surface counter tops and a serving bar for open concept entertaining. Large vaulted ceilings give very open feel. All openings have expensive hurricane shutters that can seal the home in less than 20 minutes. Bathroom vanities offer drawers that were a builder upgrade option. A very large lanai has roll up shades to provide shade during the bright afternoon sun. The home is wired with whole house sound with volume controls in every room. This is truly a must see! Owner has downsized and wants fast sale. Forest Park Homes: This is a fantastic light + bright 4 BR + den/office with preferred southern exposure - perfect for the buyer looking to escape the height of winter season or a local buyer looking for that home offering a little bit extra at a value price. One of the bedrooms is the perfect guest/in-law suite with its own full bath + private entrance (or an older teenager's dream bedroom). This home has great curb appeal, and Forest Park is a hidden gem as well - a quiet + secure gated community about 15 minutes to downtown Naples and only 7 miles to the beach. Double french doors lead to the study and to the spacious, covered, extended lanai with dual sun decks. Paver driveway with side facing-gararge, tile roof (with new roof going in to benefit the future buyer! ); the large backyard can easily accommodate a pool if desired. The community has a great clubhouse with heated pool + exercise room, too. The kitchen features 42 inch upper cabinets, solid surface counter tops + stainless appliances. Well-maintained community. Low association fees include lawn/landscape care, basic cable + internet. Convenient to shopping/I-75. This is a great value for the price - what are you waiting for? Forest Park Homes: New Tile Roof in just completed in March 2019! Move in ready and available for its new Owner in Forest Park! 3+Den, 2 baths (and Den could be easily utilized as 4th bedroom) in Forest Park with no Pool to maintain! Less than a mile to Restaurants and Shopping! Golden Gate Community Park is located just in front of community and the Clubhouse features a large Pool, Exercise Room, Game room and Kitchen within the community! What else could your heart desire? Low HOA Fees of $ 262/month include Landscaping, Basic Cable, Internet and Lawn Irrigation!! The Washer, Dryer and Water heater were just replaced in 2018 and a new stove was just added in 2019. Your Pets are also welcome in Forest Park! Ask for the solid Financials in this self managed community! Check out the Virtual Tour and Website and call your favorite Real Estate professional for a personal showing! Forest Park Homes: OPEN HOUSE TODAY! This charming 3 bedroom/2 bath home is situated in the gated community of Forest Park that is privately tucked away next to the Golden Gate Community Park. Perfect location for walking, biking, playing tennis, the park is pet friendly and has a boat ramp! Entertain on your generously large screened lanai facing the canal and lushly landscaped. This family friendly community is centrally located close to shopping, restaurants, community parks, and only minutes to the gulf! Low quarterly fees include many amenities including a large club house, exercise room, lawn maintenance and community water sprinkler system, basic cable, and internet. Please stop in and visit very motivated sellers! Forest Park Homes: Imagine living in this 3 bedroom, 2 bath home with outdoor screened lanai, above ground spa, fenced in yard on a corner lot. Sliding pocket doors open the living area up to the tropical oasis. Tile flooring, volume ceilings, kitchen nook with bay windows create a gourmet kitchen with maple cabinets, black appliances, double oven, and granite countertops. A welcoming foyer with French glass doors and custom lighting invite you into this open floor plan with volume ceilings, tile flooring, surround sound stereo system, and formal dining room. The master bedroom is open to the lanai and boasts an en-suite with jacuzzi tub, dual sinks, a large glass shower. The split design offers privacy for your guests. Interior laundry room with newer washer and dryer. A new tile roof was installed in 2019. AC Compressor was replaced in 2017 and the hot water heater in 2017. Forest Park offers a clubhouse, swimming pool, fitness center, and billiard room. Furnishings are negotiable and come with Choice Home Warranty, transferable to new owners. Covers ALL appliances for repair and/or replacement until 12/2022. Forest Park Homes: H.13957 - Your vacation destination awaits! Come escape the cold winters & enjoy warm sunny days in this charming split floorplan featuring master retreat, two guest bedrooms and two bathrooms. Imagine yourself sitting on your screened lanai watching the beautiful Florida Sunrise over the glistening lake while enjoying your morning coffee! Perfect for entertaining complete with generous great room, soaring cathedral ceilings and stacking glass sliding doors making it light and bright throughout. Great rental opportunity! Great Investment-for Seasonal Rental/VRBO! Neutral colors! Available Turnkey or Vacant! Gated Community of Forest Park offers it all…Pool/Spa, Fitness room, Recreation Room, sidewalks, close to all shopping/parks/Biking! Forest Park Homes: Introducing a charming and well-maintained 3-bedroom, 2-bath villa located on a quiet street in the gated Forest Park community. This inviting home is complimented by thoughtful upgrades throughout. Cathedral ceilings adorned in crown molding, granite countertops, a beautiful orb chandelier, and new faux wood floors are just a few of the special features you will find. The master bedroom suite showcases a spacious walk-in closet, dual sinks in bathroom with separate shower and granite bathtub. Stainless steel kitchen appliances are next to a closeted food pantry. Sliding glass doors look out onto a screened-in courtyard lanai; two-car garage, and large laundry room. Water heater (2018) and state-of-the-art AC system (2017) are both under transferable warranty. Residents amenities: large heated pool, clubhouse, social/meeting area, fitness center, billiards, and library. Golden Gate Community Park directly outside front gate. Forest Park is centrally located approx. one mile from exit 105 off I-75. Publix, First Watch, Starbucks, Walmart, and many great restaurants are all less than two miles away; get to public beaches and downtown Naples in under 15 minutes. Forest Park Homes: Just listed!! Immaculate courtyard villa – perfect family home! Charming 3 bed/2 bath. Let your kids and animals play outside within the safety of the courtyard! Walking distance to Golden Gate Community Park – playgrounds, pools, racquetball, tennis, walk/run path! Close to Publix and minutes from downtown. Need professional assistance selling your property at Forest Park Naples? Find out how an Area Specialist can help to generate more property exposure in order to get the most money for your investment in the least amount of time.